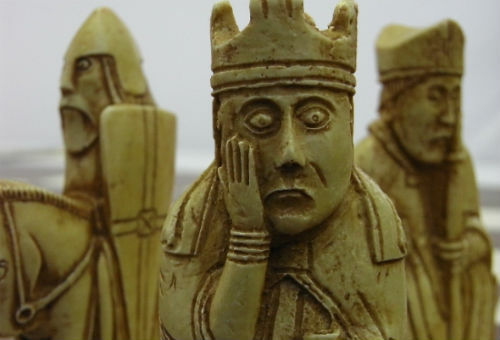 Revisit the 12th century with a replica of the Isle of Lewis chess set. Including the fascinating history of the Lewis chessmen and why it is valuable for any chess collection. 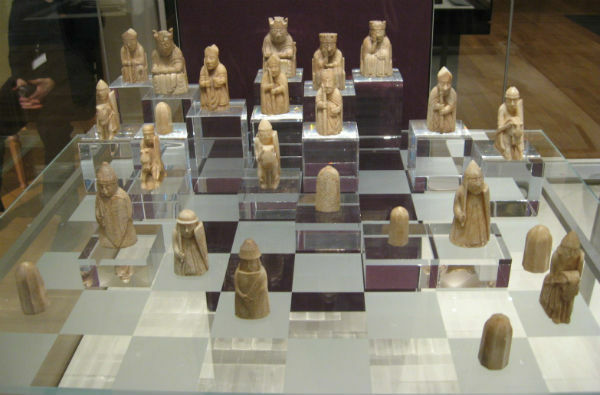 The original Isle of Lewis chess set was carved in the 12th century out of walrus ivory and whale teeth, and only discovered again in 1831. It was found by Malcolm MacLeod in a sand bank at the head of Camas Uig on the west coast of the Isle of Lewis, in the Outer Hebrides of Scotland. The set is believed to have been made in Trondheim, Norway, which was controlling that part of Scotland around the time of the chess set’s creation. It is one of the very few complete medieval chess sets that have survived until 2019. Most of the set is usually on display in the British Museum in London, while a smaller subset of the pieces are displayed in the National Museum of Scotland in Edinburgh, nearer to where the pieces were originally discovered. This chess set is an authentic replica of the famous Isle of Lewis chess set which was discovered off the West coast of Scotland, on the island of the same name. 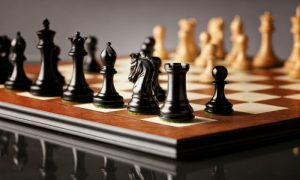 Though that historic set is currently housed in the British Museum, you can have a little piece of history in your home or office with The Isle of Lewis Chess Set – 3.5” King – METAL. 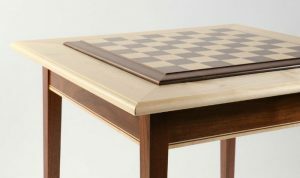 Anyone who knows anything about chess history will immediately recognize this iconic set, making it the perfect conversation piece for any chess lover. The chess pieces in this set are made from cast metal with an antiqued finish to give the appearance of age. The figures are modelled after the ancient style, featuring humanoid figures rather than abstract shapes for most of the pieces. You have the option to purchase the chess pieces alone, or to bundle them with a matching chess board and chess box for storage. It’s up to you! If you prefer authenticity over durability, there is another version of this set that is a slightly more accurate replica of the Isle of Lewis chess set. The pieces are not cast from metal, and the original brown and cream colors of the real set are maintained. We prefer the metal set for its increased durability and luxury, but the choice is yours. Both versions of this set offer a great value for the money, and you can’t beat the novelty of having one of the world’s most ancient known chess sets on your table! 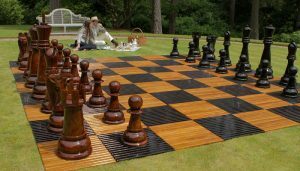 This set offers a different interpretation of the original Isle of Lewis chess set, this time made from Polyresin, which is a material that has the look and feel of stone, but the durability of plastic. This is a beautiful set, but it’s not quite as exact of a replica. The artists here take a few more liberties with the design and the materials to create a chess set that is evocative of the original Isle of Lewis chess set, but not entirely faithful to it. 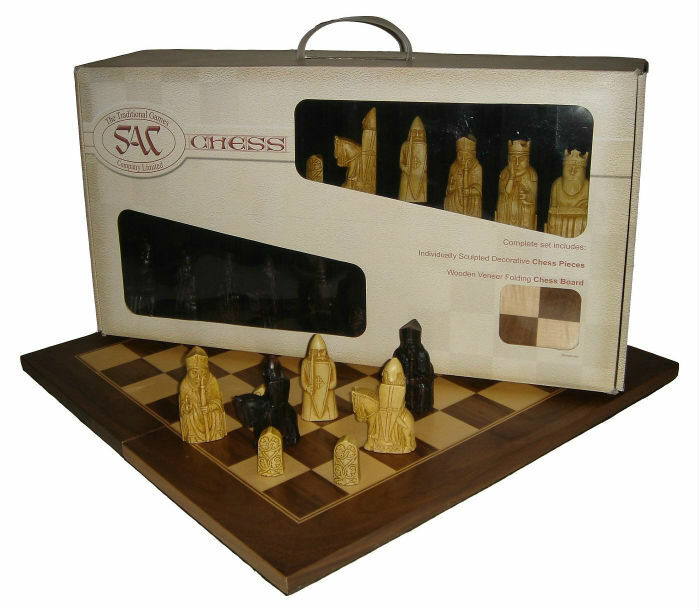 This Isle of Lewis Chess Set comes packaged in an impressive presentation box which makes it perfect for gifting, storage, or display. 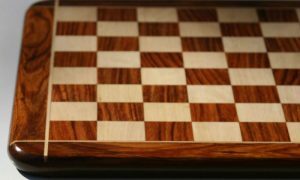 The chessboard included in this set is a folding style chessboard that is made from Rosewood and Maple, with 2 inch squares. It is plenty spacious enough to play a full game on, but also folds up compactly for storage, offering the best of both worlds. 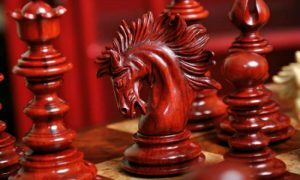 This replica chess set offers a great way to own a collector quality chess set with historical significance, without having to deal with a huge price tag. As you already know, the original Isle of Lewis chess set is widely thought to be of Norse origin. The design of the pieces is particularly telling in that regard. Historians have been able to narrow down the likely place of origin of these pieces to Trondheim, Norway because of a few key clues. First of all, a broken queen piece in a very similar style was found while excavating the archbishop’s palace in Trondheim. It was believed to have broken while it was being made. Secondly, carvings in a similar style to the pieces were featured in the Nidaros Cathedral, and lastly, further excavations have uncovered Norwegian shields and armor that are identical to that depicted in the pieces. Still, there is some dissent, as a couple of Icelandic researchers think that the set may have actually originated in Iceland. It is unknown how the pieces ended up in the stone kist where they were eventually found, but some scholars think that they were hidden there by a trader or dealer after some sort of mishap occurred during their travel toward a larger city like Dublin. Maybe they had to turn back, but left the pieces hidden so that they could come back and pick them up later. Obviously, that part never happened. When viewed with a modern eye, some of The Isle of Lewis chess pieces can look quite strange and comical indeed. The Queens are resting in sorrowful resignation with their hands on their faces, the Rook casts a sidelong glance with bulging eyes, and some versions of the warder (or Rook) even chomp down on their shields in “battle fury.” Historians insist that these designs weren’t meant to be funny, and to the people of the time they conveyed strength, ferocity, or pensive wisdom. My how the times have changed! 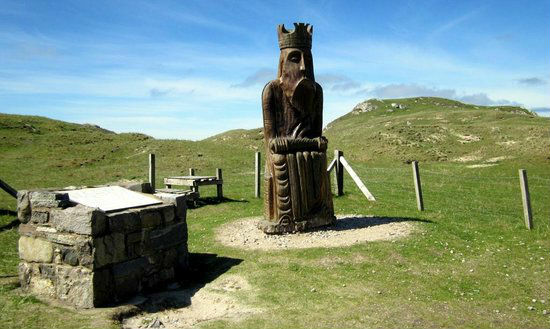 Many people are amazed to learn just how long The Isle of Lewis chess pieces sat undisturbed in their location before they were finally found. The event that eventually did it started when the sea moved and exposed a small stone kist in a sand dune. This was observed by local worker Malcolm MacLeod, who opened the kist and discovered the trove. Not knowing what to make of what he saw, he originally thought that they were Celtic pixies and sprites, but eventually he realized there was nothing particularly supernatural about the pieces and sold them to Captain Rodrick Ryrie, who recognized them as chess pieces. Of course, there are several versions of this tale that locals like to tell, each more fanciful than the last. In one version, it was even a cow who was the one to make the initial discovery! 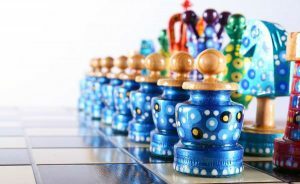 To see more of our top recommended chess sets, including other themed chess sets, check out our other lists.